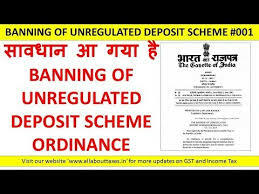 President of India has promulgated the BANNING OF UNREGULATED DEPOSIT SCHEMES ORDINANCE, 2019 w.e.f. February 21, 2019. This law has been brought to safeguard the hard-earned money of ignorant depositors from scrupulous deposit takers. 1. Running an unregulated deposit scheme. 2. Making a fraudulent default in repayment of deposits received under a regulated deposit scheme. 3. Wrongfully inducing another person to invest in unregulated deposit schemes. Loan from Banks or Public Financial Institutions. Amount received from Government or a statutory authority. Amount received from foreign party or foreign govt. as per provisions of FEMA. Capital employed by partners in the firm or LLP. Loan received by an individual from relative (Note: Loan from friends or any person other than relative not covered). Amount received as credit by a buyer from a seller on sale of movable or immovable property. Amount received by an Asset Reconstruction Company. Amount accepted by a political party. Periodic payment made by members of self-help groups operating within laws framed by the State Govt. Any other amount collected for such purpose and within such limit as is prescribed by the State Govt. Payment, advance or part payment for the supply or hire of goods or provision of services. Advance received in connection with and adjusted against consideration of an immovable property under an agreement. Security deposit for performance of a contract. Advance for long term projects for supply of capital goods, If the amount received under (i) to (iv) becomes refundable such amount shall be deemed as deposit on the expiry of 15 days from the date on which it becomes due for refund. Pension Fund Regulatory and Development Authority Act, 2013. Central Registrar Multi-State Co-operative Societies. As can be understood from the scope that wrongful inducement by any person and not just the deposit taker implies that celebrities and brand ambassador of such schemes would also be covered under the law. In various tweets by Department of Financial Services it has been clarified that Individuals, Firms, Companies and LLP etc. can take loan and deposit for their course of business and are exempt from this Ordinance. Further Chit Funds not sanctioned in accordance with Chit Fund Act, 1982 shall be deemed as unregulated deposits and thus collections in kitty parties are also prohibited. Failure to render service promised against regulated deposits Up to 7 years 5 lakhs to higher of 25 crores or 3 times the amount of profit made out of such fraud. However, this Ordinance does not cover personal loans but will affect huge network of unorganized lending prevalent in the country. The author is a practicing Chartered Accountant and can be contacted at sandeep@kcccas.com. Any comments or queries are welcome.